Happy Summer! I absolutely adore summer; being on the southern east cost, I get to really enjoy the beach a good portion of the year. Since I'm always there, having a nice bathing suit cover is a must for me. So many of the bathing suit covers I find in the stores are either not flattering, or not functional. I really don't want to have to always pull a bathing suit cover on over my head. Sometimes I want something I can just slip on that is super flattering. I also love when my clothing can do double duty. That criteria was the inspiration behind this months CAL. I wanted to design a bathing suit cover that would flatter all body types and be easy to put on (and take off) at the beach or pool. The Changing Tides Cover can be used as so much more. It's also a great warm weather cover. It would look awesome over a pair of jeans or a fancy dress. The Changing Tides Cover is available in three sizes. Small/Medium, Large/1x and 2x/3x. I'm so happy to be back for another CAL... we always have so much fun!!! I hope you enjoy making this fun bathing suit cover with me. Grab your supply list below, be sure to add thie Changing Tides Cover to your Ravelry Favorites HERE. 10 (13, 17) skeins of Knit Picks Shine Sport or 1100, 1340 or 1870 yards (500, 650 or 850 grams) of 60% Pima Cotton, 40% Modal yarn. Enter below to win the supplies you'll need to make this design, plus an extra bonus! The Changing Tides Cover features two different chevron patterns, since chevrons are one of my favorite things. In fact I love chevrons so much, that I designed and entire course of chevrons, exclusively for Furls Crochet. The Decoding Chevrons course is NOW available for an introductory price of $12 (ends June 26th). This course will teach you 7 different chevron stitch patterns. It includes two complimentary chevron patterns AND you'll get three more surprise bonus patterns (one a month, for three months, starting one month after purchase). We are letting you preview Lesson Three- Deep Chevron, which is the chevron pattern used for the top of the Changing Tides Cover. a Rafflecopter giveaway Giveaway is open worldwide. Ends Sunday 06/18/17 at 11:59pm CST. One winner will be chosen by random on Monday 06/19/17. No purchase necessary, except where prohibited. Must be 18yo to enter. Lorene Eppolite is the designer behind Cre8tion Crochet. She has been designing since October 2012. She loves to create fun and easy crochet accessories and garments. She strives to make her designs to be achievable for any skill level. Just because it is easy, doesn't mean it can't be beautiful. Lorene was named one of the Top Ten Designers by The Yarn Box in 2012 and by AllFreeCrochet in 2013, 2014 and 2015. 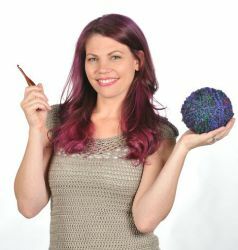 Most recently Lorene has become the Creative Director for Furls Crochet. Follow Lorene on Facebook, Pinterest or Twitter. You can also subscribe to the Cre8tion Crochet Weekly Newsletter for weekly free patterns, discounts on paid patterns, reviews and giveaways and business tips. Vanadia Badillo is not just the incredibly beautiful model you see here, but she's actually an inspiring entrepreneur and medical aesthetics expert first. When she's not helping woman & men achieve their true beauty potential, she's behind the lens helping brands and companies with their vision by providing support through modeling. She's definitely done that for us! Vanadia has a genuine concern for self love, self confidence, and self esteem and provides Medical Aesthetic services, style & life coaching through her brand. You can reach out to her if you're in the ATX area at luminousface.skin.mind@gmail.com.